Their head to head battles had resulted in one win apiece. In the semi finals, South Melbourne disposed of Collingwood while Carlton easily accounted for Essendon. The final between the two clubs was a hard fought and, at times, brutal encounter. After an even first half, the Blues slowly pulled away to run out eventual winners by 22 points, but as minor premiers, South Melbourne had the right of challenge and the stage was set for the 1909 grand final on the following Saturday. The talk around town in the lead up to the Grand Final centred on the need for the South players to play the ball rather than go the man if the club was to have any chance of adding to its five VFA premierships. It would need to devise a plan to counter the might of the finals hardened Blues. From the first bounce it was evident that South had taken on board the advice that had been offered freely by a host of well-wishers in the week leading up to the match. The players took every opportunity to send the ball out wide into the open spaces to avoid being bogged down in the heat of the crush. The play was fast and free flowing and was a far different spectacle to the one which had played out on the previous Saturday. While the level of skill on show was of the highest standards, both teams were inaccurate in front of the posts and neither managed to score a major in the opening term. The normally reliable champion South Melbourne forward, Len Mortimer, was the main culprit for the red and white missing three chances in quick succession. He was not alone. It appeared that the importance of the occasion was having an effect on the players and the teams went to the first break on five behinds apiece. The second term produced more of the same exciting football that had thrilled the crowd of more than 36,000 in attendance in the opening term. The spirit that the game was played in was of an agreeable contrast to so many that had been played throughout the year. Despite the fair play on show, the determination of the players to win the football resulted in a number of players going down with serious injuries. Carlton's volatile Jack Baquie suffered a debilitating leg injury, and though he was expected to be of little use for the remainder of the afternoon, he made his way to the forward line with the hope that may still be able to make a contribution to his team. Both teams had straightened up in front of the posts in the second term. The Blues were first to display the improved accuracy with a fine kick by George Topping that saw the ball just clear the reach of the South Melbourne defenders manning the goal line. With Topping's goal, sympathies in the crowd appeared to swing in favour of the Southerners. It was widely acknowledged that they had played the best football in the early part of the match, but they had been devoid of any luck and should have been further in front. South maintained its strategy of taking a wide path to goal and took every opportunity to run the ball along the Richmond side wing. They rushed the ball forward again to a contest where a scrimmage formed close to goal. After some heated play in the crush, the ball was suddenly kicked clear of the pack by rugged South ruckman, Albert Franks. The ball appeared to float in the air as it left his boot but did enough to reach the target and post South Melbourne's first goal on the board. The excitement in the crowd was clearly visible and it increased noticeably when the ball was rushed forward soon after the ball was bounced in the middle. Charlie Ricketts gathered the ball deep in the South Melbourne forward half and kicked truly to add a second goal to his team's tally. Though the Southerners appeared to be playing the better football, there was nothing that would deny the Blues from making their own assault on goal. The Carlton defenders were not about to concede any further goals and worked hard to win the football before sending it clear of the back half. The ball was rushed unimpeded to the opposite end of the ground and into the path of noted Carlton forward, Frank Caine. It seemed certain that the scores were about to be levelled when Caine took possession, but the inaccuracy that had been evident throughout the early stages of the afternoon's play was once again on show. When Caine unexpectedly missed his chance from only a few yards out, an audible groan sounded out around the ground as those in support of the Blues expressed their despair at Caine's untimely error. It seemed that the South Melbourne players would be rewarded for their first half heroics and take a well earned lead into the main break. The Blues, however, were not yet done and made one last effort to close the narrow deficit. Fortune favoured the Blues as they pushed forward to provide Topping with an opportunity to add to his earlier goal. The little Carlton forward set the ball for a place kick and lined up from 50 yards out. Topping launched into his kick and as the ball left his boot and sailed towards goal, the bell was rung to signal the end of the term. The ball continued on its path and the crowd held their collective breaths. To the dismay of those in support of the red and white, the ball split the uprights to send the teams to the main break on level terms. South Melbourne had outplayed the Blues for much of the first half, and it was strongly felt that they had, at times, suffered the greatest misfortune in the contest. The question bandied around by those in the crowd as the teams were addressed in the change rooms during the long break was could the Southerners maintain the pace and style of play that had served them so well in the first half. The third quarter promised much for the eager crowd and early indications were that they would not be disappointed. It was a free flowing contest which saw the ball travel the length of the ground in each direction with both speed and skill. It took until mid way through the term for the first goal of the half to be posted on the board. It was the South Melbourne forwards who eventually gained the break through after a series of passes saw the ball shared around in the forward half before a final kick by Mortimer - who had finally found his range - added a third goal to the South Melbourne tally. Though there was plenty of time still remaining in the match, South looked to be in a winning position and appeared almost unbeatable as they moved the ball around with deft precision. As the Carlton supporters had no doubt expected, it was simply a matter of time before their team countered the play of their Southern rivals. The experienced Carlton players were not yet ready to relinquish their position as the competition's premier team and made a determined push forward with the ball. Baquie, resting deep in the forward line and almost lame from the injury he sustained in the first term managed to win possession deep in the Carlton forward half. He dribbled the ball off his boot towards the goal. His kick had just enough on it for the ball to cross the line before any of the South defenders could make their way back to the goal front. When play resumed in the middle, Belcher won the ball for South Melbourne and sent it out wide to where his teammates had gathered. They were able to easily win possession and continue along the well worn path to goal. Grand play from the Southerners provided Mortimer with a chance, but his shot hit the post for only a minor score. The ball was kicked back into play where South Melbourne defender, Tom Grimshaw, intercepted with a telling mark. Now with his own opportunity to stretch the lead, Grimshaw set the ball up for a place kick. His kick looked good as the ball left his boot, but it slammed hard into the goal post just as Mortimer had done just moments earlier. The one thing not working in favour of the Southerners was their luck in front of the posts. Play continued in a give and take fashion and the players were visibly tiring from their exertions. A heavy scrimmage near the centre of the ground attracted a large crowd of players from the two teams. Vigorous work in the crush saw players fall about in all directions and it ended with Carlton's Martin Gotz receiving a serious injury that required the talented half back to be carried from the ground. South now held an advantage in numbers and Alf Gough was quick to capitalise on Carlton's misfortune. To the rousing cheers of the South Melbourne faithful, Gough strode forward unattended and sent the ball goal-ward. He made no mistake with his running kick and scored his team's fourth goal. The bell rang soon after to signal the end of the third quarter with South Melbourne holding a lead of 7 points. 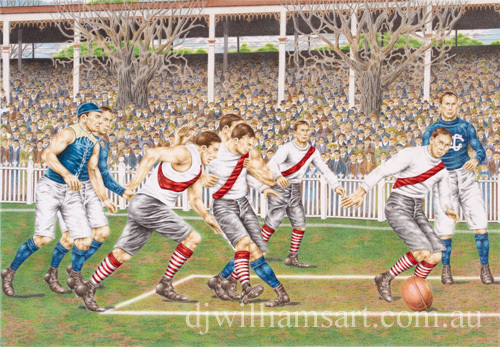 As the players broke from their three quarter time huddles the crowd was abuzz and eager for what promised to be an exciting end to the 1909 season. When the Carlton players took up their positions, the injured Gotz was amongst them, and he made his way forward to line up in a pocket. With the injured Baquie taking up a position in the other pocket, Carlton would play out the final quarter with just 16 fit men. Both teams made their intentions clear in the early stages of the term. They would continue to perform in same free flowing manner that had so enthralled to crowd throughout the first three quarters. The continuous attack and counter attack made for an absorbing contest. Despite South's continued good showing, and the limitations forced on the Carlton team through injury, most of those who followed the red and white - neutral patrons amongst them - suspected that the experienced Blues would keep coming and might yet even run down the Southern club. There was little to convince the crowd otherwise as several forays forward by South Melbourne failed to produce a goal. The Carlton followers then began to gain control of the contest. Their rushes forward became more frequent and a number of strong runs carried the ball within range of goal only to be denied by a dogged South defence. One such rush forward managed to bypass the South Melbourne backs and saw the ball kicked deep into a pocket where Harvey Kelly marked close to the boundary line. The former South Melbourne man lined up for the important kick, and with barley an opening in the goals to aim for, he sent the ball between the posts for Carlton's fourth major of the afternoon. The two teams were now separated by just two points. As the time on the clock continued to slowly tick away, the play swung from one end of the ground to the other and drew those in the crowd to cheer wildly for every possession. As the match wore on, Carlton looked to be playing the better football and maintained the assault on goal. The South Melbourne defenders continued to hold back the tide but appeared to be tiring under the waves of relentless pressure. With barely two minutes left remaining in the match, Carlton ran the ball forward along the wing for what would surely be their last chance to secure the victory. The ball was kicked within range of goal and as a number of players rushed to the football to contest possession when the bell was rung to put an end to Carlton's promising advance on goal. South Melbourne was victorious. It was the club's first premiership in the Victorian Football League and the win put an end to Carlton's enduring reign as the premier club in the competition. The South Melbourne supporters were delirious and they rushed onto the ground to carry the players triumphantly on their shoulders. Final scores: South Melbourne, 4. 14 (38) to Carlton, 4. 12 (36) For South Melbourne, Franks, Thomas, Kerr and Belcher were arguably the team's best players. While for Carlton, it would be difficult to go past McGregor, Jinks and Payne. Topping was the only multiple goal scorer in the match with 2 for the Blues. Footage of this match has been made available by the National Film & Sound Archives and can be found on You Tube (1909 VFL Grand Final).